In the matter of mathematics, 2 4 1 may be out of order, but when it comes to bingo this site has a formula that can’t be beat. It is a site that comes to life in a virtual world where numbers are the name of the bingo game. 2 4 1 Bingo boasts Jackpot winners and a community of players that puts you in the spotlight. Whether you count up, down or the 2 4 1 way there is a 24/7 bingo schedule that fits your personal lifestyle. Compact for easy user friendly navigation, yet expansive for all the important details is what 2 4 1 Bingo is all about. There is a welcoming feeling of a soft pallet of colors that are not over done yet make a statement. The homepage speaks for itself with everything and anything that a curious bingo player wants to know. The newsletter is informative with current events offered and conveniently located in full view. Read for yourself from real players their experiences first hand in a community that includes a gallery of 2 4 1 customers. This feature adds a social aspect and a network of players offering a nice touch of pictures that puts a face to your bingo roomies. Registering is made quick and simple with no credit card required to sign-up. Whether on the homepage or in inside the lobby the live bingo schedule is eloquently laid out with times and bingo variations that best suit your personal needs. Catering to a global market, games can be played and fit easily within your location and time slot. 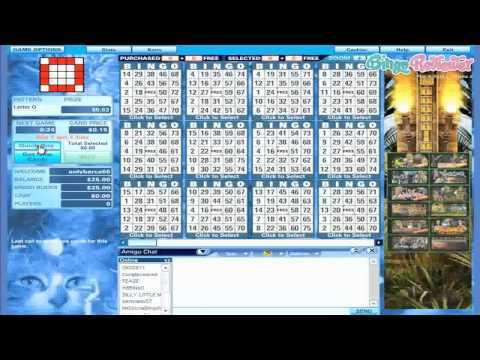 Bingo is the spice with 75 and 90 ball bingo variations from the Parlay software platform. Players will be challenged with 100’s of creative patterns that keep bingo interesting while providing full entertainment value. Bingo rooms fit every type of budget and wagering style, appealing to the high roller and low roller player. Free Bingo is a nice option for a risk free playing experience. Chat hosts entertain roomies with extra fun during bingo play with chat game prizes. Progressive Bingo Jackpots fill rooms up fast for a chance to win serious cash. Integrate Mini Games to your bingo game and have powerful gaming action. Don’t pass up the Casino Games rich with Slots machines and cash prizes. Scratch Cards, Pull Tabs, Video Poker and Keno compliment the site for total package of online games. Players will revel with the free No Deposit Bonus and a Welcome Bonus that goes beyond any expectations. The generosity is impressive and exceeds well beyond many online bingo site offerings. Freerolls with massive cash prizes offer interactive competitive playing where top players win real cash. Join fellow members in Team Bingo and share prizes among your team mates when taking first place. If a holiday get away is what you fancy, you’ll have a chance to be whisked away in some of the most exciting ports around the world. It pays to play at 2 4 1 Bingo with a Benefit Program that spoils players with money back and pay your fees offers. Unlike some bingo sites, 2 4 1 Bingo takes pride in a well taken care of operation. The promotions and newsletters are kept current and are never months behind schedule. If this much care is put into their business, it can only mean the very best quality care for their customers. We rate this site with 4.5 pink hearts. One thing I really like about this site is that they give you a chance to play many of their games for free right from the start. It’s always nice when a gaming site allows you to do this and it starts them off with a little more credibility in my eyes. I also liked that they provide a bingo schedule. It seems like the obvious thing to have but a lot of sites don’t, at least for unregistered players anyway. One of their bingo sessions is the exciting midnight madness session. This is, by far, one of the favorites. It kicks off in the Coral Reef Room at 11pm every night and goes on until 1am. They also have some fun side games, like their version of tic tac toe which takes place every day at 11am. In their version of this game you need to collect three X patterns or three O patterns to earn your tic tac toe prize plus $20 BBs! I don't really like how this site looks, and it looks like it was put together from a few templates. Simply nothing to make it different from so many other sites out there. Not to mention that there is no mobile site version and that it doesn't shine on larger screens. It is a Parlay site, so I knew there were some good Slots, and I was right, they have 3D Slots, which in my opinion are probably among the best. But, let's not forget the bingo, and there are three rooms: Main room, Blue Room and Weekend Room, with 75 and 90 ball games, which are regular. They also have some really interesting chat games, just to make the whole thing even better. New players get a $20 no deposit bonus to start with, but also a hefty 600% first deposit and 400% second deposit bonus, and that is something to think about.